Who cooks dinner and does the dishes? Cleans the house? Puts the kids to bed? Why is it that these activities are so readily associated with women’s household roles? How is it that these activities are not valued in the same way as other types of work? And, why is it that many middle class households around the world have come to rely on paid domestic workers – sometimes from overseas – to undertake this work? These are all issues that feminist political economists have brought to the study of IPE. This unpaid work calculator was developed by the Office for National Statistics in the UK and is one way in which we might be able to calculate the monetary value of these kinds of activities. It is certainly worth trying it out and comparing your economic contribution with friends and family members. Feminist political economy asks that we look not only at the monetary value of housework (and other unpaid forms of work) but also at the social relations of housework – who does what and why – and consider how this work became gendered and valued less than other kinds of work. Taking this approach, scholars have argued that everyday activities such as housework are central to maintaining life and reproducing future generations and in that sense are intimately connected with the functioning of the capitalist economy. However, domestic work, frequently defined and dismissed as ‘labour of love’, is largely invisible to neoclassical economics which focuses on market relations alone. In Marxist economics, domestic work is also treated as secondary to ‘productive labour’ in respect to the creation of surplus value and the expansion of capital. One of the most important theoretical contributions of feminist political economy has been to define activities like housework and care work as socially necessary labour. That is, labour that is essential to the reproduction of life itself and is therefore something that cannot simply ‘drop out’ of understandings of how the economy functions – this labour is called social reproduction. Discussions of housework and domestic labour were, in the 1970s and 1980s, central to feminist analysis and visions of liberation A central feminist demand is that ‘the personal is political’ which, for feminist political economists, means that we should do away with the idea that the ‘private’ sphere of the household and the ‘public’ sphere of productive work are easily separable. In the 1950s and 1960s, feminist writers in the US such as Betty Friedan sought to challenge the idea that women’s role was primarily domestic and that women should aspire to become good mothers and housewives. 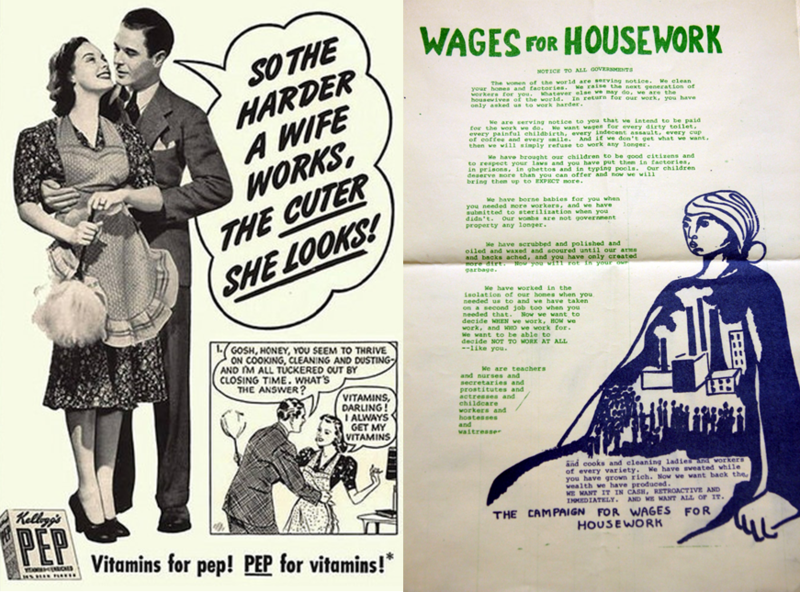 An influential stream of Marxist feminist work later demanded ‘wages for housework’ as a way to challenge the undervaluing of women’s domestic labour, in essence by commodifying it. Writers like Friedan, however, were challenged by black feminists such as bell hooks who pointed out that this was a specifically white, bourgeois, feminist concern that neglected poorer and non-white women’s labour force roles. In Europe and North America it was these groups that had traditionally carried out the paid domestic work by non-family members. This was often assumed to be a pre-modern form of labour that had largely disappeared over the course of the 20th century, enabled by the expanding automation of housework in the form of vacuum cleaners, washing machines, microwave ovens, and so on. What was treated as an anomaly, though, soon became a growing trend. In the global North, increases in women’s labour force participation were accompanied by the contracting of certain forms of housework and care work through the market. As some women left their house to earn money, others moved in to do the same – displacing the ‘double burden’ to this latter group of female domestic workers. We know that jobs such as nannies, au pairs and cleaners are exceptionally low paid forms of work and feminist political economy provides us with some tools for understanding why this might be. Domestic workers themselves often are not considered to be ‘real’ workers doing a skilled job and they also experience problems such as abuse – at times violent – that stem from the dominant, and deeply gendered, idea that what goes on behind closed doors is not a public concern. We also need to look at how gender intersects with a range of other factors such as class, race, nationality, and migration status, in order to create and maintain the vulnerability of workers. For example, gendered, and often racialized, paid domestic work has historically been excluded from labour standards or social security regimes, even in Western welfare states. Because of these factors, some types of domestic labour might be understood as unfree labour. Migrant women in particular are highly vulnerable to some extreme forms of exploitation. Even in states such as Canada – a country largely considered to have a progressive migration policy that grants migrant workers the opportunity to seek citizenship – we can see how state practices serve to uphold conditions of unfreedom for these workers. Unlike immigration regulations applying to permanent residents and work permits for ‘skilled’ migrants coming to Canada, temporary work permits for domestic workers have categorically disallowed migration with family members. The immigration status of domestic workers was demoted from permanent residency providing many rights and freedoms to temporary status in the early 1970s. This was a period when there was an increase in participation of women in the labour market and a consequent rise in the demand for domestic workers. The expansion of certain groups of women’s freedom to work outside of the home was supported by general improvements in women’s labour rights during this period – but this expansion of opportunities for one group of women also depended upon increased employment of poorer and or migrant women to do the housework and other caring activities within the home. In 1981 after nearly a decade of regulations that involved a ‘revolving door’ approach to the entry of domestic workers, the Canadian government introduced the Foreign Domestic Movement program, followed by the Live-in Caregiver Program in 1992, which allowed them to apply for permanent residency after a minimum of two years’ service. This seems to provide an advantage for newly-arrived domestic workers in Canada compared to most migrant workers in other locations, but the regulations of the immigration programs (compulsory living-in; forced separation from family; lack of mobility rights; the success of permanent residency application being conditional on relations with employer) constitute serious conditions of unfreedom for the workers. The regulations systematically enable employers to violate labour regulations and consistently force workers to ‘put up or shut up’ about their working and living conditions in order to fulfil their dream of permanent residency in Canada. A number of feminist and anti-racist campaigners and academics have sought to raise concerns about the nature of this program; one such campaign group produced the video below, highlighting the prevalence of Filipino women in this role. The migration of workers from poorer to richer countries to take up employment as domestic workers is an example of what we might term ‘globalized social reproduction’. The same workers who move internationally to care for others’ children or elderly parents do so under conditions where they are not able to provide direct support for their own families and households. This can be understood as a transnational ‘care gap’. Even under the Live-in Caregiver Program in Canada, the restrictions imposed on migrant workers prevent workers from migrating with their families, and the requirement that caregivers live with their employers, have ensured that these domestic workers keep their family ties in their ‘home country’ out of sight and mind of the ‘host country’. The burden of family separation can be extremely difficult to bear as this video shows. Many migrant women seek to address this ‘care gap’ by developing practices of ‘transnational mothering’ whereby motherhood involves financial responsibilities and long distance relationships maintained through phone and Skype. But they are often overwhelmed by feelings of longing, guilt and anxiety about the well-being of their children, and a sense of sadness, loss and loneliness. They also express mourning over loss of family and community. Indeed, the costs of migration are not just individual and private. As Lise Widding Isaksen and her co-authors argue, hidden in relations of migration is ‘another, yet more basic, inequity…the opportunity to live as part of an integral whole – a family and community… being together, seeing each other, talking directly, physically touching – in a word, co-presence’. Feminist solutions for the challenges of social reproduction need to address it in all its intersectional complexity. Rather than helping solve the challenges of social reproduction in countries that import migrant workers, globalized social reproduction adds further problems. Restrictive immigration policies in receiving countries have either pushed domestic workers underground as ‘undocumented workers’, or actively limited their rights and freedoms –including the right to migrate with their families. Rather than advancing gender equality, existing forms of globalized social reproduction complicate it through global inequalities and inequalities of race, nationality and citizenship status. The result has been further degradation of the value and significance of social reproduction by society, the economy and the state. Feminist solutions for the challenges of social reproduction need to address it in all its intersectional complexity. Dalla Costa, M. and James, S. (1972) The Power of Women and the Subversion of Community. Bristol: Falling Wall Press. Bakan, A., B. and Stasiulis, D., K. (1997) Not One of the Family: Foreign Domestic Workers in Canada. Toronto: University of Toronto Press. Bezanson, K. and Luxton, M. eds (2006) Social Reproduction: Feminist Political Economy Challenges Neo-Liberalism. Montreal: McGill-Queens University Press. Arat-Koç, S. (1989) In the Privacy of Our Own Home: Foreign Domestic Workers as a Solution to the Crisis of the Domestic Sphere in Canada, Studies in Political Economy, 28, pp. 33-58. Isaksen, L., Widding, S. U. D. and Hochschild, A. R. (2008) Global Care Crisis: A Problem of Capital, Care Chain, or Commons, American Behavioral Scientist, 52 (3), pp. 405-425.